Music, food, and art festivals are incredibly fun, but they can have their unique set of health obstacles. You will be happy you read this nifty blog post when you see most people standing in line for food in the blazing sun and you are SERIOUSLY prepared! Unlike other more traditional plans such as dinner parties, holiday events, or even concerts at MSG, festivals start in the spring and are usually outside, hot, with TONS of people, varied food/beverage options and can last anywhere from 1 night to several days. They can bring some of the best memories from your spring and summer, but more often than not... you didn't prepare your body! Consider some of these healthy tips before you head out to your first festival of the season. I sometimes feel like I bring up water & hydration in every single blog post. It is also something I have difficulty with myself, so it is definitely something that even the most health-conscious individuals need to be mindful of. If you are consuming alcohol at said festival, increase the fluid intake even more! Festivals can be HOT, and typically you are standing outside all day in the blazing summer heat, OR if you have festivals in the spring you live in a state that is already HOT, SO HYDRATION IS A MUST. Not just when you are there, but before you leave. The last thing you want is to become dizzy, nauseous and have a headache at a music or arts festival. Definitely bring your reusable water bottle with you. Maybe even pack one that fits easily in your bag. Take a high-quality probiotic that doesn’t need to be refrigerated. Support your gut and your immune system with probiotics before, during and after your planned festival. Whether it is a food, art or music festival, you will likely be eating interesting foods and you will certainly be in a large crowd of people. 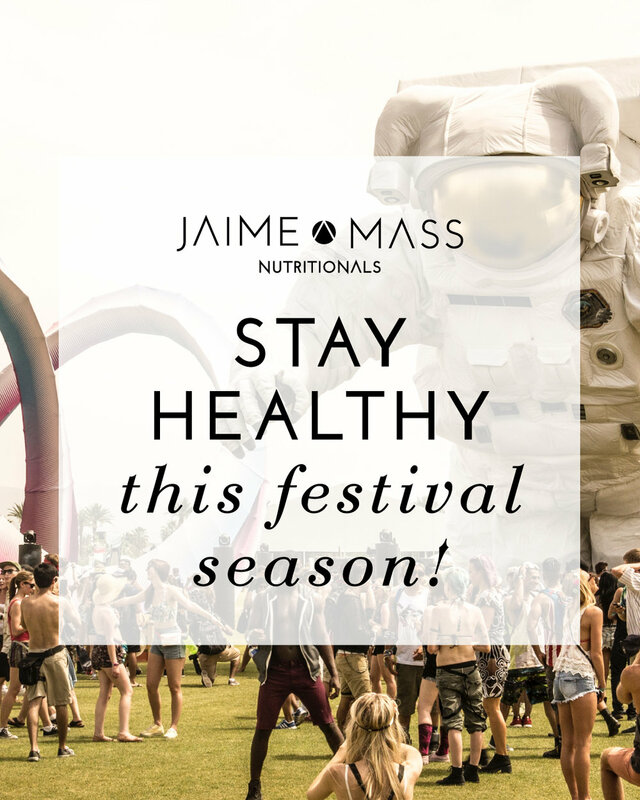 If you will be traveling to your festival in plane, train or car with a bunch of people consider checking out our Body Guard in addition to our probiotic - Belly Balance and share with your friends, you’re doing them a favor! I know it isn’t nutrition related but it is health related, and I am all about overall healthy living. In addition, excessive exposure is dangerous and causes wrinkles. So, don’t forget the sunscreen. Getting burned on the first day of a multiple day festival can be a serious downer. If you are going to an all-day festival do not depend on the schedule there or that you will be eating within a timely manner. Even if it’s known for its foodie vibe you want to be fueled for the whole day and not be at the mercy of a food truck. If you’re going to an early afternoon through evening event, eat a nice meal before you go, especially if your fest is on a campsite with unknown food vendors. Don’t arrive hungry, you will likely want to enjoy the moment and activities when you arrive; not sit down right away and eat! Protein powder in a little baggy or very small container (make sure it is secure). Portable nut butters are amazing! Like barney butters single packs, so easy to carry with you and even if they get warm they are still NO MESS and super easy to eat. Although there really is no way to make a fried oreo healthy - or gravy fries for that matter. You can make a taco stand healthier, focus on the proteins and veggies added to sandwiches or food tastings and ditch the bun/bread or rice. You should also keep your eye out for healthy options. Many festivals are making an effort to have both trendy food items and healthy food items on trend as well. If you see it take advantage of it. They may not always be there or the group you are with may not be excited about standing in two lines. Either way you will be prepared with the snack suggestions above. Go with the best of intentions and plan for success! If some things don’t go as planned with food and beverage; consider supporting your liver a bit more after the festival. Go big with antioxidants in your food and supplement routine. Opting for a liver loving product, like our Clean Slate that includes powerhouse liver herbs such as Milk Thistle, antioxidant producing compounds such as NAC & L-Methionine and detoxifying support from Calcium-D-Glucarate. Most of all, enjoy the music, company, warm weather and delicious eats!